Error Message Msg 242, Level 16, State 3, Line 26 The conversion of a nvarchar data type to a datetime data type resulted in an out-of-range value. Next question is why is 105 (passed as the style argument) ? So it appears we have a mismatch between the code which is expecting to get back a date formatted for 105 (dmy), European, and my SQL Server’s login\session default of mdy. In our case, our permanent fix will be to create a dedicated Login for our application and assign an European language to it. Here is the code line for changing our Login's language to British English. To get an inventory of available languages, query syslanguages. For our specific use-case, we are only interested in US and British English. 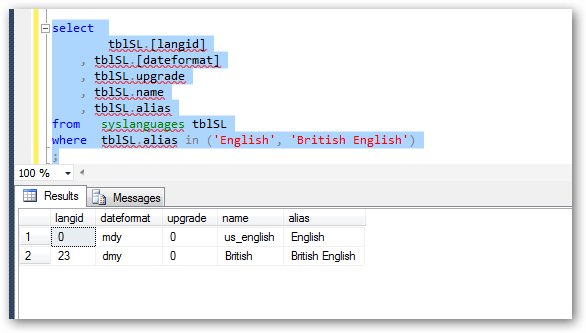 How does SQL Server effect default language settings? Glad you asked. Resetting the connection results in a different state than the initial login. The login fails. 2014-11-15 11:44:37.00 Logon Error: 18456, Severity: 14, State: 28. 2014-11-15 11:44:37.00 spid64 Error: 18056, Severity: 20, State: 28. 2014-11-15 11:44:37.00 spid64 The client was unable to reuse a session with SPID 64, which had been reset for connection pooling. The failure ID is 28. This error may have been caused by an earlier operation failing. Check the error logs for failed operations immediately before this error message. Dedicated to Sierra Leona born Medical Doctor, Martin Salia, who is fighting a far more worthy battle. Ebola has really brought to light the transcendental work of communities of faiths such as “Pan African Academy of Christian Surgeons” (PAACS) – https://www.medicalmissions.com/network/organizations/pan-african-academy-of-christian-surgeons. Sorry used up a lot of ink, thank God, no paper, to try to shed light on a little obscure topic.